The Type 4 rating and polyester powder coating make these enclosures ideal for outdoor environments or food processing applications where it is necessary to protect controls and instrumentation from wet, non-corrosive environments. 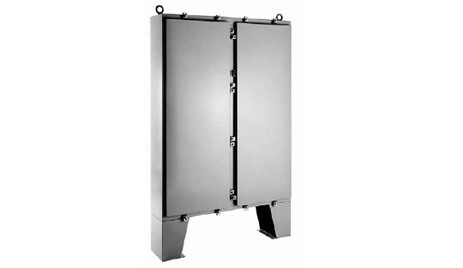 Featuring a continuous hinge with clamps, the enclosures are supported by floor stands that provide additional height and access for cleaning under the enclosure. Equipment can be mounted on either panels or racks. Download the Two-Door with Floor Stands, Type 4 Floor-Mount Enclosures spec sheet below or call 714.835.6211 for more information.